Today marks a major step forward in our work to protect consumers. In a first by a federal financial regulator, the Consumer Financial Protection Bureau (CFPB) will share with the public individual-level consumer complaint data received by the CFPB. Check out the Bureau’s policy statement for more details. No longer will consumer complaints only be known to the individual complainant, bank, regulator, and those in the public willing to pursue this information through the Freedom of Information Act. Instead this data-rich window into consumer financial issues will be widely available to everyone: developers, policymakers, journalists, academics, industry, and you. Our goal is to improve the transparency and efficiency of the credit card market to further empower American consumers. And just to be clear, no personally-identifiable information, such as a consumer’s name, credit card number, or mailing address will be made available via the Consumer Complaint Database. The Bureau’s Consumer Response function receives consumer complaints on a wide variety of products including credit cards, mortgages, student and other consumer loans, and other bank products (such as checking and savings accounts). And while the Consumer Complaint Database initially will contain only credit card complaints, the Bureau is proposing to extend the Database to all other consumer financial products and services covered by the CFPB. What happens when a consumer files a complaint? When a consumer files a complaint, Consumer Response intake specialists review each one for completeness, jurisdiction, and non-duplication. Complaints that meet these criteria are then forwarded to the appropriate company (bank or nonbank) for review and resolution. Companies are given 15 days to provide a substantive response to each consumer complaint, and are expected to resolve and close all but the most complicated complaints within 60 days. Consumer Response prioritizes for investigation certain complaints based on a handful of risk-based criteria including the failure of a company to respond in a timely manner and those in which the consumer disputes the company-provided resolution. When potential legal violations are detected, Consumer Response works closely with other parts of the Bureau including the offices of Supervision, Enforcement, and Fair Lending to ensure potential violations are dealt with appropriately. Throughout this process, consumers have the ability to log into the CFPB’s website to check the status of their complaint (and, when appropriate, dispute the resolution provided by the financial institution). Today, we’re releasing the beta version of the Consumer Complaint Database. Why beta? While the complaint information in the database is actual data, the functionality, data fields, and “look and feel” of the database are all in the beta stage of development. In other words, this version of the Consumer Complaint Database is only the beginning. In addition to potentially enlarging the Database to include all other consumer financial products and services covered by the Bureau, we are looking into potentially expanding it in a number of other ways. These include the possible addition of narrative fields (to the extent we can do so while protecting personally-identifiable information), more sub-product and sub-issue data fields, regular and normalized data visualizations, and expanded data tools. 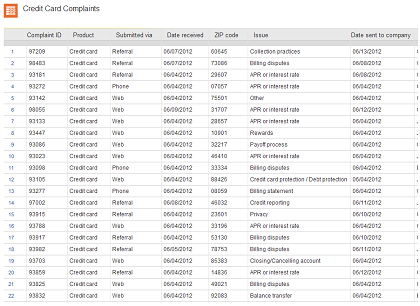 Lastly, you will note that initially the Database only contains complaints received by the CFPB on and after June 1st. Additional retroactive data will be added when we remove the “beta” tag later this summer. We encourage you to tell us what you think about the Consumer Complaint Database by telling your story. All comments and suggestions are welcome. Scott Pluta is the Chief of Staff and Acting Assistant Director for Consumer Response at the Consumer Financial Protection Bureau.